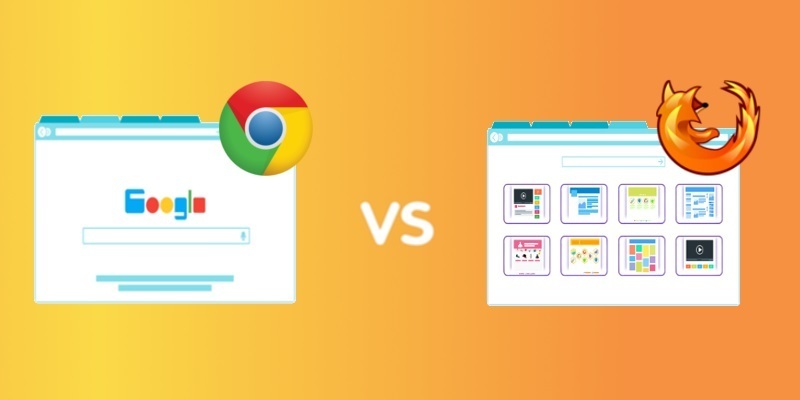 Like most matters on the Internet, there are numerous threads dedicated to answering one of the Web’s most divisive questions: Which is better, Google Chrome or Mozilla Firefox? 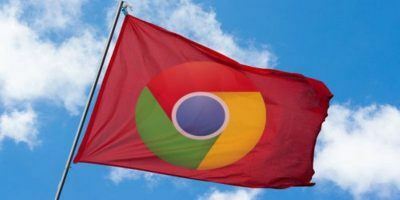 Chrome has held the title of “most popular web browser” since 2016, but with the release of Firefox Quantum, people are beginning to wonder whether Chrome will remain at the top. Google says that its browser is still the best on the market, but Mozilla insists that Firefox can outpace and outperform its long-time rival. Loyalists on either side will tell you that their browser is the best, so the only way to reach a verdict is to compare numbers. If you only look at usage stats, Chrome consistently comes out on top. According to W3Counter, Chrome commanded almost 60% of the world’s desktop browser usage this past February alone. Comparatively, Firefox’s browser market share was 8.5%, making it the third most popular browser after Safari. Interestingly enough, browser usage for Firefox spiked to 9.3% in the months following Quantum’s release but has since fallen. Mozilla claims that Firefox Quantum is twice as fast as its predecessors and loads web pages faster and uses 30% less memory than Chrome. Mozilla even released a video where they test how fast each browser loads popular sites like the Google login page, Wikipedia, Tumblr, and BBC. Quantum is definitely faster than previous versions of Firefox, but even in Mozilla’s tests, it only beats Chrome by fractions about half the time. 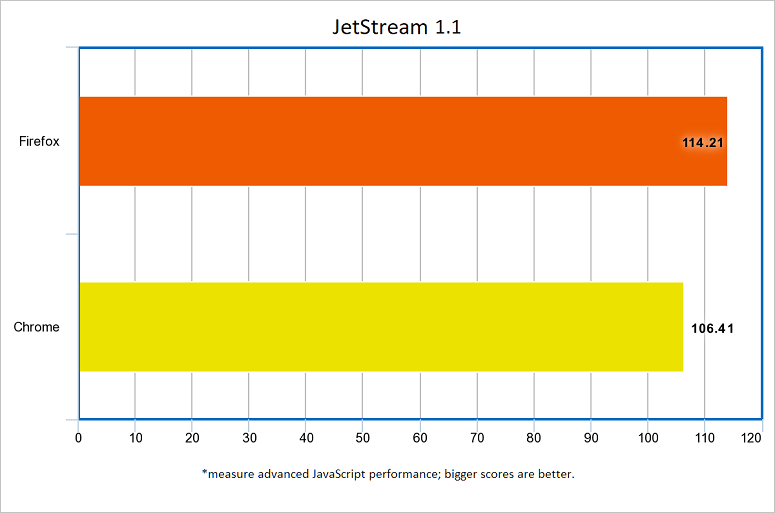 Benchmark tests like JetStream 1.1 show that Quantum is better than Chrome at managing complex workloads, and some data usage comparisons show that while Firefox doesn’t quite reach the 30% threshold that Mozilla claims, it does use less memory on average than Google Chrome. This might be in part because Chrome has a dedicated process for each tab, which can use up to 20% more RAM. 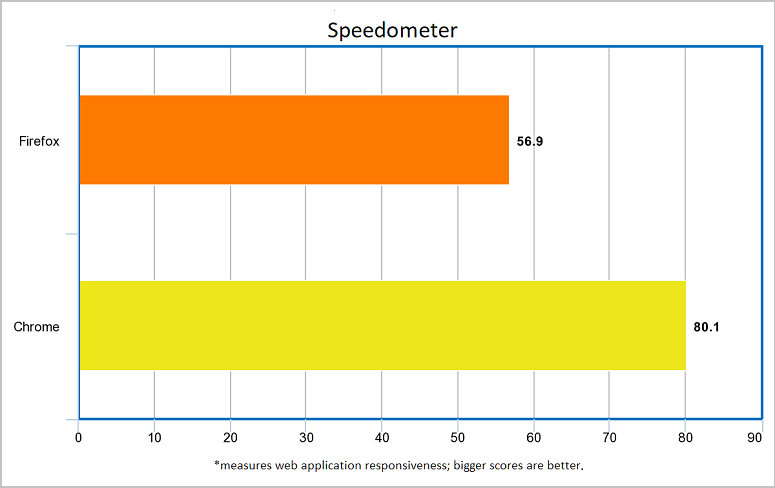 On the other hand, benchmark tests like Speedometer show that your interactions with web apps are more responsive (faster) in Chrome. While some may find Google Chrome’s “less is more” design choices preferable to Firefox, Chrome still looks a lot like it did in 2008. Alternatively, the new Firefox Quantum browser looks sleeker and more modern. Quantum’s address bar now offers suggestions based on your open tabs, popular searches, history, and bookmarks. 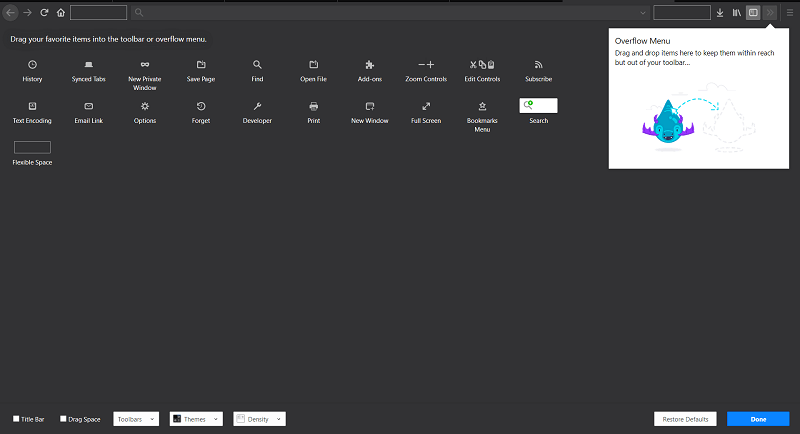 There’s also a redesigned dark theme, a new look for the New Tab page, and you can drop and drag buttons to customize the Toolbar. When it comes to extending browser functionality, Mozilla Firefox and Google Chrome tie. 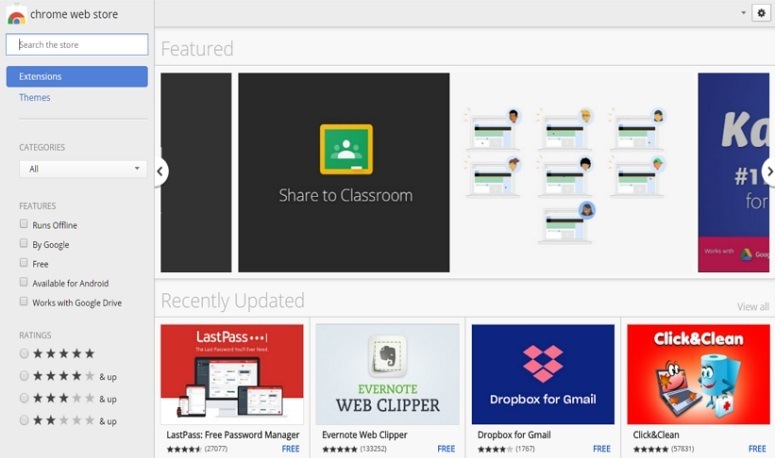 Both have expansive extension libraries where you can find various themes to customize your browser, and both support numerous add-ons including ones for popular applications like Grammarly, Microsoft Office, and Spotify. Still, Mozilla made significant improvements to the way Firefox handles extensions. 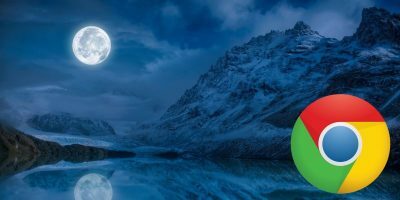 When they released Firefox Quantum, they also introduced a new extension API, WebExtensions, that follows a similar model as the one used by Google Chrome. 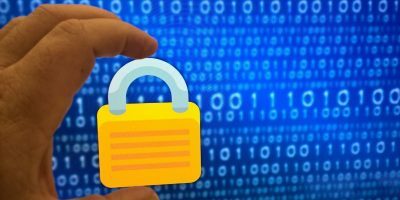 WebExtensions helps keep Quantum secure by restricting what extensions can and can’t access in the browser. 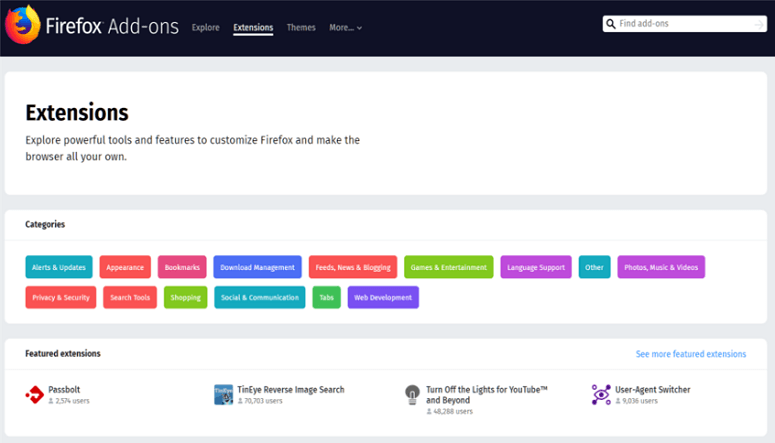 Moreover, add-ons developed using the new API are cross-browser compatible, meaning developers can run Firefox extensions on Chrome (and Opera) with minimal changes. 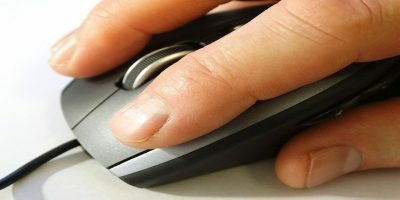 So you’ll probably see more Chrome add-ons available in Firefox’s extensions library and vice versa as developers take advantage of their new portability. Many of Firefox Quantum’s feature updates are things you’ve already seen in Chrome, like a built-in QR code reader and the ability to sync and send web pages to all your devices. Still, the new Firefox browser has things you won’t find in Chrome like inverting colors with “Night Mode” or taking screenshots of entire web pages. Chrome comes with its own set of privacy and anti-tracking settings like “Do Not Track” and Chrome’s new native adblocker, but they aren’t as impressive as Quantum’s advanced security options. You can set up Quantum to actively block undesirable ads, pop-ups, analytics trackers, and even scripts that might try to collect your data. 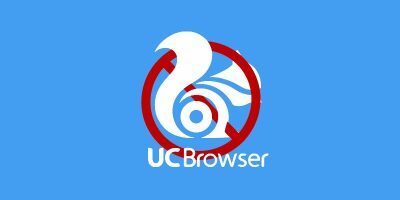 Mozilla also says browsing in Private Mode loads web pages 44% faster than regular browsing and reduces data usage by 39%, which is something Chrome doesn’t offer. Ultimately, the winner of the Chrome vs. Firefox Quantum debate depends on what you’re looking for in a browser. If you want a more minimalist design and greater responsiveness when using web apps, Google Chrome is likely the choice for you. However, if you have major concerns about memory usage, security, or run complex applications in your browser, Firefox may be the better pick. 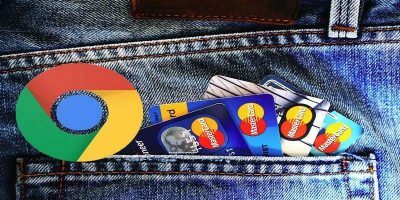 Both Quantum and Chrome have great extension libraries, and both let you import bookmarks or passwords from other browsers, so you won’t lose much if you decide to switch. No matter what the surveys, studies and head-to-head comparison say, Firefox is “better” for me because I am familiar with it. 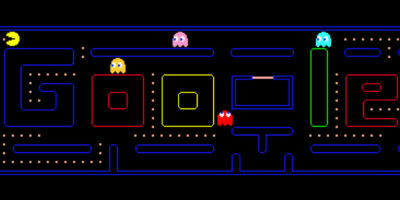 Unfortunately, Google has its spying tentacles into FF. I used chromium for a long time on Linux because hardware acceleration for videos wasn’t enabled or working in Firefox, firefox had some stability issues, dark themes didn’t play nice, and Firefox didn’t have client side decorations. I’ve switched back though recently now that all of that stuff is finally fixed and I love it. I still had to go into about:config and force enable the hardware acceleration and use newer versions that aren’t stable yet for the client side decorations but it’s finally possible to have a great Firefox experience on Linux. I see Mozilla focusing Firefox a lot on privacy these days. Even though it does not seem users are that concerned about it enough to switch from Chrome. I think Chrome is probably the worst browser for privacy by default but it hasn’t affected its market share in the least. Firefox also has not improved its market share and in fact still is on the decline. It begs the question, does anyone really care about privacy or is Chrome simply that entrenched in users like Google search that they simply do not want to switch browsers? The problem with Firefox is that it is a Java script browser, which is a hackers paradise. Chrome is much more secure. A fraction of speed difference is not my main concern. My concern is a more flexible, secure, less ad based browser. Obviously the open source Firefox Quantum is my choice. I have opened more than 15 tabs in Firefox and it still flying thru with no problems at all. The only thing is some of the native Chrome options such as music casting won’t work with Firefox.